The second-best team in the NBA as of April 1, the Toronto Raptors have clinched a spot in the playoffs and were one of only two teams with 56 wins or more across the league. The Raptors will be heading to the postseason for the 11th season since they joined the league as an expansion team in 1995. Despite the great product on the court, the average asking price for Raptors tickets is down nearly 19% against last season on the secondary market, from $219 to $178, according to secondary ticket marketplace TicketIQ.com. For the regular season, Toronto has the 11th most expensive ticket in the NBA. With the playoffs right around the corner, fans can expect to pay a premium for post-season tickets. 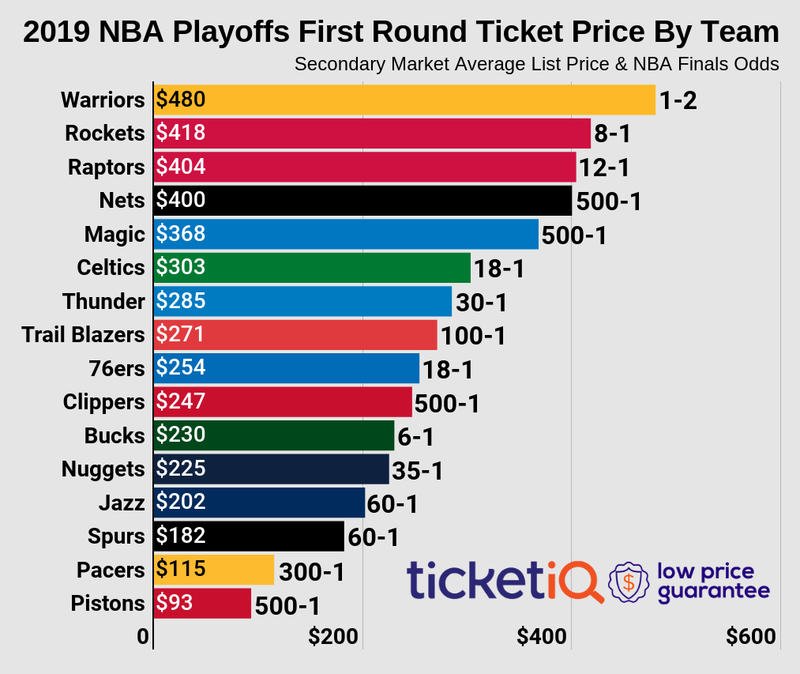 According to TicketIQ.com, playoff tickets on the secondary market generally cost 54% more than regular-season tickets. Below is a look at historical secondary market prices for Raptors playoff tickets. Single-game Raptors opening round playoff tickets go on sale via Ticketmaster this Friday. If you miss out on face value ticket from Ticketmaster, fans who want to see the Raptors in the postseason, face-value reservations are still available through Shoowin.com, which offers consumers the opportunity to reserve tickets for big events and then purchase them at face value when they become available. According to the Shoowin website, fans can save up to 98% over other ticket sites. While the opening round reservation market is closed, fans can reserve tickets for the Eastern Conference semifinals beginning at $20, and for the Eastern Conference finals beginning at $25 for the if-needed home Game 4. Reservations for Games 1 and 2 of the conference finals at Toronto are $59 and $60, respectively. Fans can reserve tickets for the NBA Finals at Toronto for between $75-$183. Toronto hasn’t had much luck in the playoffs, advancing as far as the Eastern Conference finals only once. The Raptors lost to Cleveland in six games in 2015-16. But Toronto has been in the mix for the last five years, advancing at least as far as the Eastern Conference semifinals three times.